Are you a Caregiver? Login with the form below. If you are a Care Seeker click "Login as a Care Seeker" above. Username Username must be a valid email. Are you a Care Seeker? Login with the form below. If you are a Caregiver click "Login as a Caregiver" above. Deciding to seek in-home care for yourself or a loved one is one of the most important decisions you can make. That’s why CaregiverNC makes the process simple by keeping you in control. CaregiverNC was created to provide a virtual platform for care seekers in search of private-duty caregivers in Cary, North Carolina. CaregiverNC gives you the ability to choose a professional personal care or at home caregiver in Cary that you believe is the best fit to provide the care you desire. CaregiverNC has a proven process for screening and credentialing all caregivers, so that you can feel confident in your choices. 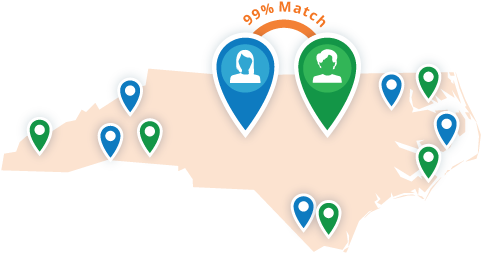 Through our match technology, Cary caregivers and care seekers can determine compatibility of needs prior to making contact. We are North Carolina’s ONLY Accredited Caregiver Registry. We are the ONLY Caregiver Registry who has a Vetting Process. We SPECIALIZE in matching Care Seekers with compassionate Caregivers. 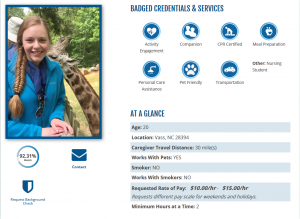 Looking for the Right Cary Caregiver? Find Your Best Match Here! For more information about CaregiverNC and our team of Care Concierges who can walk you through every step of the process, call us today at (877) 405-0665 or get in touch with us here. If you still have questions about our caregiver matchmaking platform, click the button below for details on “How it Works”. 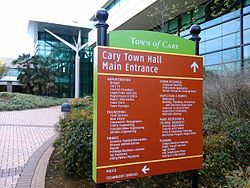 Are You a Professional Caregiver in Cary Looking for Opportunities? Great…you’ve come to the right place! CaregiverNC was created for those seeking private-duty care opportunities. Our Caregiver registry’s Web platform brings together Caregivers and Care Seekers. It allows you to create a profile highlighting specific skills and abilities. CaregiverNC’s matching database pairs you with potential Care Seekers looking for the qualities you possess, so that both parties can be sure it’s the best fit. Every Care Seeker is searching for a Caregiver who can provide a certain type of service, whether it be companion care, personal care, dementia care or Alzheimer’s care. CaregiverNC lets you determine the types of services you are willing to perform for a Care Seeker, while also allowing you to determine the schedule and pay rate directly with the Care Seeker. For more information about CaregiverNC and our matchmaking platform, call us today at (877) 405-0665 or get in touch with us here. If you have more questions and want to see “how it works” for Caregives, click the button below. Interested in learning more about the Care Concierge program? Fill out the form below! We are North Carolina's ONLY Accredited Caregiver Registry. Deciding to seek in-home care for yourself or a loved one is one of the most important decisions you can make. That’s why CaregiverNC makes the process simple by keeping you in control. All of the Caregivers listed on our registry are pre-screened and pre-verified to ensure they can provide you with the best care possible. CaregiverNC was created to provide a virtual platform for care seekers in search of private-duty caregivers. It is part of a larger family of services that provide consumers with one-stop shopping for all aging care needs. Aging Outreach Services (AOS) has been providing consumers with access to screened, credentialed and verified caregivers through our Caregiver Referral Registry since 1999. CaregiverNC allows me to carefully chose caregivers who matched our mother’s personality. Daily notes left by caregivers let us know how our mom’s day had gone and what housekeeping/activities had occurred. I cannot say enough about the caregiver referral services provided by CaregiverNC. My mother lived alone in Southern Pines. My brother and I live a long distance away, Florida and Arizona. A couple of years ago, I visited my mother and noted the condition of her house was becoming unhealthy. It was obvious to me she was not able to be in her house without some assistance. Mom wanted to remain at home. Working with the attentive CaregiverNC team member, we found caregivers who were most attentive and understanding. They went beyond just doing their jobs to keep Mom at home and safe. When it was time for my mother to relocate closer to me, a caregiver escorted her on the journey. The caregivers have been key in helping us get Mom’s house, etc. ready for the next phase of listing and selling. I would recommend contacting CaregiverNC when your parent needs support. I would like to express our deepest gratitude to our caregivers, who were, to say the least, a godsend. It is very hard to put into words what they did for my family, not just for my Dad. Their compassion was extraordinary, their skill set was incredible and scheduling flexibility was remarkable. They were hard working, and most importantly, they were so kind and thoughtful to my Dad no matter what his mood was on any particular day. Their actions engendered a trust from all of us so that we felt comfortable to have them in our home and caring for Dad. My friend is not always an easy person to get along with, and she even rejected a few of the initial caregivers who came to her home. However, the CaregiverNC team very quickly helped me find people my friend is comfortable having in her home and receiving care from. As I had promised my friend to keep her in her own home as long as possible and in the area where her social circle is, the decisions that have had to be made over the years would not have allowed me to keep my promise without CaregiverNC and the addition of care management services. There are not enough words to express my gratitude and good fortune I feel for having CaregiverNC on our team. I was so pleased with how my dad looked and felt when we visited a few days before Christmas. He and his caregiver have a sweet relationship. I know one of our concerns was how dad would bond with new caregivers. So many positive strides have been made in his wellness and in the overall function and structure of the house as a unit. I am so pleased with where we are today and the CaregiverNC team gets all the credit for that. Thank you from the bottom of my heart. CaregiverNC was the answer to my many prayers. After our first conversation, they referred excellent home care providers for my mother within a week. They connected me with a professional care manager who could help me every step of the way. I immediately felt a huge relief from many burdens as they slowly took the reins of caregiver responsibilities from me. I no longer had to be with my mother 24 hours a day. I didn’t have to keep up with medications, laundry, housekeeping and grocery shopping. The peace of mind this assistance provided me was priceless.